It's a new year. Hello! One of my recent newsletters covered the topic of blogging advice, and it received such a positive response from readers that I wanted to share it here to kick off 2013. Almost exactly one year ago, I was fighting off a cookie craving by standing in the hallway with a book of poetry in my hands. Eat This Poem was born just hours later, so it's only fitting that I'm in a reflective state of mind as 2012 comes to a close. When a friend suggested I start a blog in 2008, I laughed it off. Only after we discussed it more did I realize that a blog would solve a very critical problem in my life: I needed a creative outlet. I had always been interested in writing and photography, and had been teaching myself to cook for the past five years. I didn't see what an opportunity it was at the time, but I realized much later that this was a space to find my voice. I also resisted starting a Twitter account, but have now made genuine, real life friendships because of it. What a world we live in! I've given a lot of thought to blogging, what it means to me, and the opportunities its provided, but have rarely written about it. Almost five years in, I'll be the first to admit that I'm not the final authority on blogging, but I have learned a few things along the way that I offer to you here. 1. 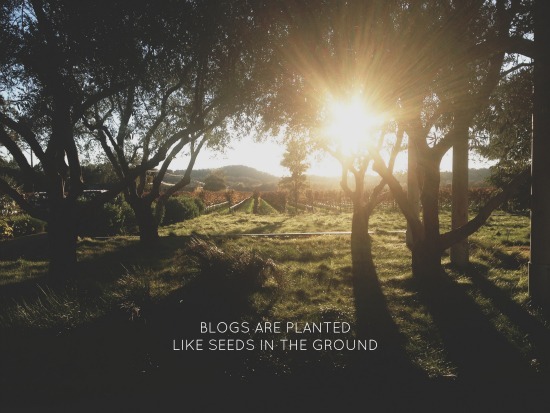 Blogs are planted like seeds in the ground, so start where you are. The blog you have now will grow and change in ways you might not be able to imagine in two or three years from now. You'll be a better writer or cook or artist in six months or a year. Don't let this stop you from beginning. 2. Write, create, and dream for yourself first. It's crucial you don't lose this ability when starting a blog.